Kersten Hamilton is a prolific children’s writer. She works with the house church movement in her home town of Albuquerque, New Mexico. Here’s Kersten Hamilton’s website. CLICK HERE FOR MORE BOOKS BY KERSTEN HAMILTON. Goblin Wars — (2010-2013) Young adult. 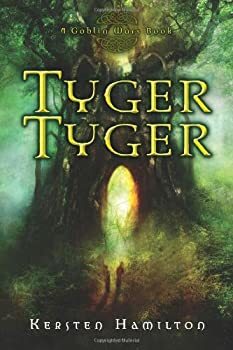 Publisher: Teagan Wylltson’s best friend, Abby, dreams that horrifying creatures — goblins, shape-shifters, and beings of unearthly beauty but terrible cruelty — are hunting Teagan. Abby is always coming up with crazy stuff, though, so Teagan isn’t worried. Her life isn’t in danger. In fact, it’s perfect. She’s on track for a college scholarship. She has a great job. She’s focused on school, work, and her future. No boys, no heartaches, no problems. Until Finn Mac Cumhaill arrives. Finn’s a bit on the unearthly beautiful side himself. He has a killer accent and a knee-weakening smile. And either he’s crazy or he’s been haunting Abby’s dreams, because he’s talking about goblins, too… and about being The Mac Cumhaill, born to fight all goblin-kind. Finn knows a thing or two about fighting. Which is a very good thing, because this time, Abby’s right. The goblins are coming. I wanted to love Tyger Tyger. I’ve got a soft spot for teenagers-in-faeryland stories, and this one gets off to a terrific start. Teagan, the heroine, is working at a Chicago zoo; she plans to pursue a related career when she grows up. I can’t praise Kersten Hamilton highly enough for giving Teagan a concrete aspiration like this. The YA paranormal field is alarmingly full of heroines who seem bland without the magic or without the male lead, and have no idea what they want to do with their lives. The novel hits a snag pretty quickly, though, with the introduction of Teagan’s best friend Abby. Abby is so hyper she’s exhausting to read about. She’s rather like the Tasmanian Devil masquerading as a teenage girl.